1. A camera capable of shooting HFR must be used, and one that provides quick switching between recording frame rates and camera timebase. 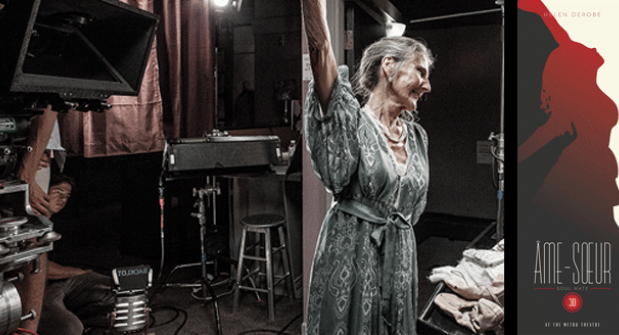 A noticeable delay on camera will discourage the experimentation of HFR on set. Red Epic (up to 120fps 4K, 300+ 2K), Red One (up to 60fps 4K, 120fps 2K), Phantom 65 (4K up to 141fps, 2K up to 169fps), Phantom FLEX (2K up to 1560fps), Arri Alexa (2K up to 120fps), Arri Flex D-21 (2K up to 60fps). Unavailable when we were preparing for our shoot, now the Sony F65 CineAlta has been announced and shoots 4K up to 72fps, and 120fps at 2K. 2. 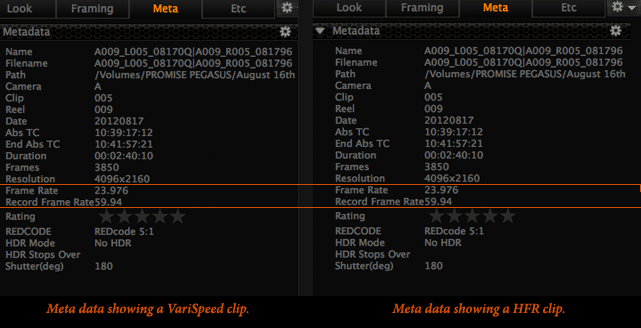 Remember to match the in camera timebase to the recording frame rate. This is an important but easily confused step for HFR projects. A non-matching timebase and frame rate will result in a VariSpeed product, NOT an HFR product. This is of upmost importance to double check, as the genlock device on your camera configuration could cause a slip in sync (resulting in temporal offset) OR reset of timebase. Rig: Kernercam S3D rig with motorized IA, convergence, and focus on Preston controllers. Cameras: RED Epic filmed at 4096×2160 resolution at 59.94, 48.95 and 23.98fps timebase/recording frame rate with a shutter angle of 180 degrees. Why 24, 48, and 60fps? The use of 24fps in this production –as the SFR– was chosen due to our North American location, and audience familiarity with the frame rate aesthetic. 48fps was chosen because it is simple to double the 24 frame rate, and if it is required in double flash for projection, this could be done easily. Also since The Hobbit was filmed at 48fps, we were curious to see what the aesthetic was like. 60fps was chosen with television in mind. 60fps performs well on 60Hz, 120Hz and 240Hz TVs without compensation in the motion. 60fps is double the frame rate of regular broadcast television at 30fps, so we considered this might make the frame rate easier for testing in a broadcast environment. Shutter speed is the amount of time the shutter is open to expose the sensor / media. Frame rate is the number of frames per second. 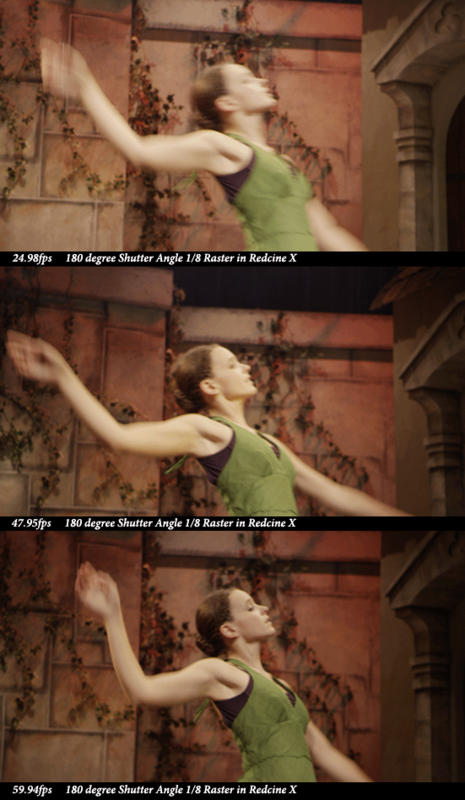 Shutter angle (in degrees) is the film equivalent to shutter speed and is used by most professional systems. It was the DPs and Stereographers choice to keep the shutter angle for our film at 180 degrees for creative purposes and the above reasons concerning judder/blur. 270 degrees was used on The Hobbit for what appears to be creative/aesthetic reasons, and that particular shutter angle introduces a bit of a cinematic looking blur back into the picture. We had looked at many tests of shutter angles with HFR completed by Fraunhofer and Park Road Post, and it is very clear that each shutter angle also has its own aesthetic. Many HFR enthusiasts claim 270 and even 360 degree shutter angles in HFR content produces a better looking image. More testing will be needed to explore these claims, and this is an area in which the SMPTE HFR work group is very active. Results should be available WInter/Spring 2013, and we will have an idea after watching The Hobbit on what this combination of 270 degree shutter angle/48fps looks like. The production of VFR HFR 3D content was remarkably similar to that of a normal SFR 3D film project. We were unable to monitor out in HFR during production, as we were unable to access monitors / tools needed to do so. At the time we could not find any HD-SDI devices from Matrox, AJA or Blackmagic that were able to signal out at the HFR, but that may no longer be the case now. There was no delay on camera to switch between frame rates, it was just a couple pushes of a bottton although we had to be cautious of retaining genlock. The only main difference is that we shot each scene in 24, 48, and 60fps. That may have meant more takes in the long run in order to get coverage. Otherwise shooting S3D in HFR was very akin to filming a non HFR production.